To quickly upload multiples images, you will need to add the quick upload portlet to the folder where you want to add the images or files (see Adding right-hand portlets). Click the browser button to locate the images or files you wish to upload then 'shift-click' to select mutliple files, and clikc OK. Here you can add titles for the files/images if you wish to, before you upload, then click 'upload files'. After a brief pause, you will see the files appear in the folder. 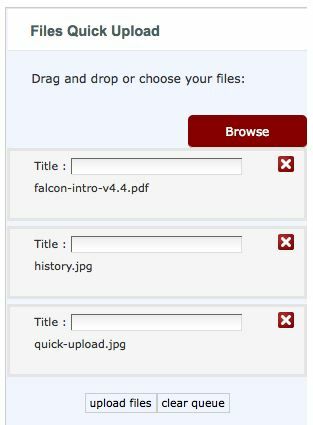 If you are uploading many files/images, and don't want them listed in the left-hand navigation, create a folder to upload them into, or move them to a folder after upload, and exclude the folder from navigation. Don't name the folder 'images', as there is a top-level folder of that name and Falcon's intelligent finding may be cause confusion with multiple folders of the same name.